Dr. Javier Rios is a board-certified and fellowship-trained primary care sports medicine physician. He obtained his medical degree and completed his residency in family medicine at the University of Texas Medical Branch in Galveston. 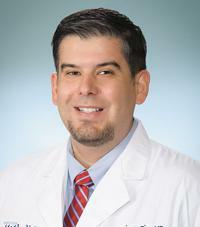 Dr. Rios then completed a primary care sports medicine fellowship at the University of Oklahoma College of Medicine. His practice focuses on the nonsurgical management of all musculoskeletal orthopedic conditions and sports injuries in athletes and active people. He also manages chronic conditions such as arthritis that can make a person's everyday activities difficult. Dr. Rios treats acute and chronic injuries and takes a non-operative approach to the management of joint disorders, including neck and back injuries. He is proficient in casting and splinting fractures that do not require surgery, as well as diagnostic and therapeutic ultrasound-guided injections of the shoulder, elbow, hand, wrist, hip, knee, ankle and foot. As a member of the Houston Methodist Concussion Center, Dr. Rios specializes in the assessment and management of concussions, using ImPACT baseline testing. Dr. Rios also serves as a team physician and resource for many of the local school districts in the Bay area.